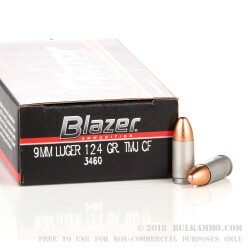 Blazer Brass is an ammo company that has long been known for its quality and value. They are one of many companies owned by sporting equipment giant, Vista Outdoors. Vista Outdoors has 2 specific sides to their business... outdoor gear, and firearms. Blazer's Clean Fire Ammunition offering is made using CCI's revolutionary Clean Fire Primer System. The Clean Fire Primer system is built specifically for target shooting at indoor ranges, and training purposes. The Clean Fire primers produce much less powder fouling, lead, and airborne pollutants than any other primer system currently on the market. They keep your hands and firearms cleaner, and still allow you to train with the same intensity as you usually do. 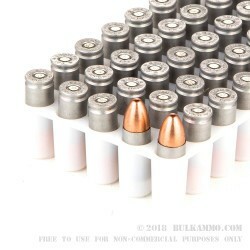 These rounds are topped with the 124 grain Total Metal Jacket 9mm bullets, with Berdan Primed (Clean Fire of course) Aluminum cases. 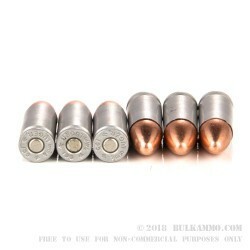 This 9x19 ammo pushes a muzzle energy of 327-foot pounds and a subsonic muzzle velocity of 1,090 feet per second. This ammo comes packed up for your next range trip in 50 round boxes, with 20 boxes to a case of 1000. At these affordable prices, you can get yourself enough bulk cases to shoot all year long.